From the porch of her Palmerton farmhouse, Albertine Anthony looks out on the rolling hills of lower Carbon County. She believes the PennEast pipeline’s proposed route through her 124-acre farm threatens her water supply. 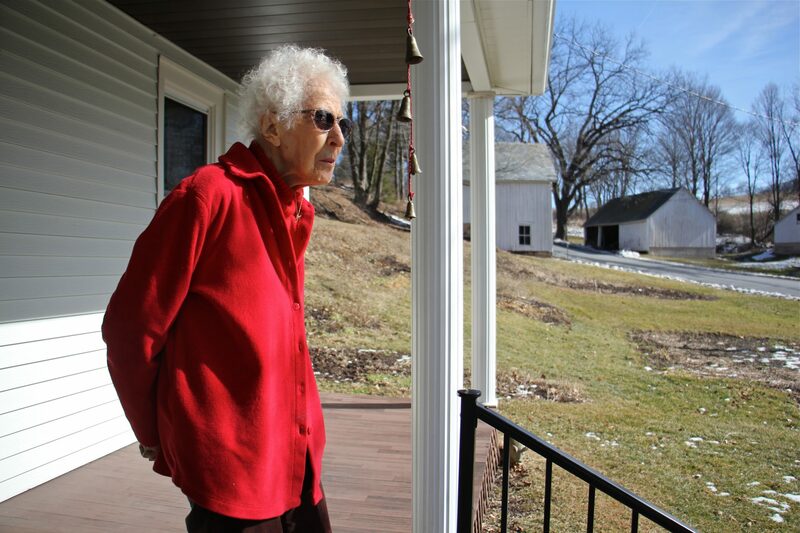 Albertine Anthony has been living in the same picturesque Carbon County farmhouse since she was born 93 years ago, and she’s not going anywhere even if PennEast builds a natural gas pipeline across her land. Anthony, a tiny figure with a slight stoop and a shock of white hair, was offered $37,000 by the company as compensation for building the pipeline across a corner of her 124-acre farm that was first purchased by her grandfather, and where tenants now grow crops including corn and oats. She might have gotten used to the idea if the company hadn’t changed its plans and redrawn the pipeline route so that it crossed a wetland containing the spring that has supplied her house with water for three generations. The idea that pipeline construction might destroy the spring that provides fresh, clear water by gravity – even to the second floor of her house – has set her firmly against PennEast’s plans and led her to tell them that she’s not accepting their compensation at any price. Despite her alarm at the prospect of losing her spring water, Anthony says she’s not moving even if the pipeline is built on her land. If the spring is damaged, she would just have to drill a well and install pipes, she said. A sign on the side of a barn on Riegelsville Road in Holland Township, New Jersey, shows local opposition to the PennEast pipeline. Now that she has turned down the company’s offer, Anthony is among 50 Pennsylvania landowners who are being sued by PennEast to take a portion of their land using eminent domain. Court records show the company filed 28 suits in federal court for the Eastern District of Pennsylvania on Feb. 6, and another 22 cases, including Anthony’s, in federal court for the Middle District of Pennsylvania, also on Feb. 6. The filings were prompted by federal energy regulators issuing a long-awaited Certificate of Public Convenience and Necessity for the pipeline in mid-January, allowing the company to begin its legal effort to obtain the lands from uncooperative owners. The actions came the day after a deadline imposed by PennEast for landowners to accept or decline its offers. The pipeline route passes through four Pennsylvania counties – Luzerne, Carbon, Northampton and Bucks – on its 120-mile route from northeastern Pennsylvania to Mercer County, New Jersey where the company says it will improve the supply of low-cost gas to households and utilities. On Feb., 16, New Jersey asked FERC to stay its certificate approving the pipeline, and to hold a rehearing on the issue. Attorney General Gurbir Grewal, argued that the certificate is flawed by allowing PennEast to mitigate environmental damage to streams and wetlands rather than minimizing or avoiding those impacts. Grewal, arguing for the Department of Environmental Protection and the Delaware and Raritan Canal Commission, said such mitigation is only permitted under the federal Clean Water Act if an applicant shows avoidance or minimization but that is not possible in PennEast’s case because two-thirds of the route in New Jersey has not been surveyed — due to the resistance of many landowners. He also said the company has not provided DEP with a site-specific plan on how environmental impacts to streams would be mitigated, and has not done a geological study on the impact of its plans to drill under waterways. The request urged FERC to amend its certificate to allow PennEast to condemn only the properties where it is “absolutely necessary” to conduct surveys and environmental assessments, so that all sides will have a full understanding of the project’s impacts. PennEast spokeswoman Pat Kornick urged FERC to deny the request for rehearing, saying that the regulator has already considered the issues raised by New Jersey. “PennEast looks forward to a transparent process and working collaboratively with NJDEP, ” she said. On the eminent domain filings, Kornick declined to specify the number of suits that had been filed, or say whether it was planning any more after those filed on Feb. 6. She declined to discuss individual cases, and said PennEast files eminent domain only as a last resort because it is “emotional, burdensome and costly” for all sides. Critics, including the New Jersey Rate Counsel, an advocate for utility ratepayers, say the pipeline is not needed, and that the eminent domain law is being misused because the project, despite the FERC ruling, is not truly in the public interest. Linda and Roy Christman object to the PennEast pipeline’s use of their land, in Christman family hands for four generations. The proposed pipeline would run through their fields behind the chicken coop. Roy Christman, another Carbon County landowner who has refused PennEast’s compensation offers, said he doesn’t object to eminent domain if it’s used for a project that is clearly in the public interest, but he argued that doesn’t apply to PennEast. Christman, 76, retired to the 23-acre farm after some 30 years teaching political science in a California college, and is now the fourth generation of his family to live there. His determination to resist PennEast is fueled by the fact that since 2008, his land has been shielded from development by Pennsylvania’s farmland preservation program, under which the owner sells the development rights to the state, preventing the land from being built on in perpetuity. Despite the protection program, Christman and his wife Linda face the prospect of losing about four acres of their land to the pipeline, which they say will be buried to a depth of only three feet, raising their concerns about whether it could be hit by a plow. Linda, 72, said she resents being unable to control what’s happening on her own land. A yard sign on Pohopoco Drive in Lehighton, Pennsylvania, shows local opposition to the PennEast pipeline. Linda, an artist, said she’s fully expecting the courts to rule for the company when the eminent domain cases are argued in coming weeks. But she’s still optimistic that the pipeline will eventually be defeated by one or more of the agencies that have yet to issue permits. They include the New Jersey Department of Environmental Protection, the Delaware River Basin Commission, and the U.S. Fish & Wildlife Service.